to make a statement with their monumental structures. And the definition of a “mansion” is not so much tied to the quality of the home, but the sheer SIZE of it. 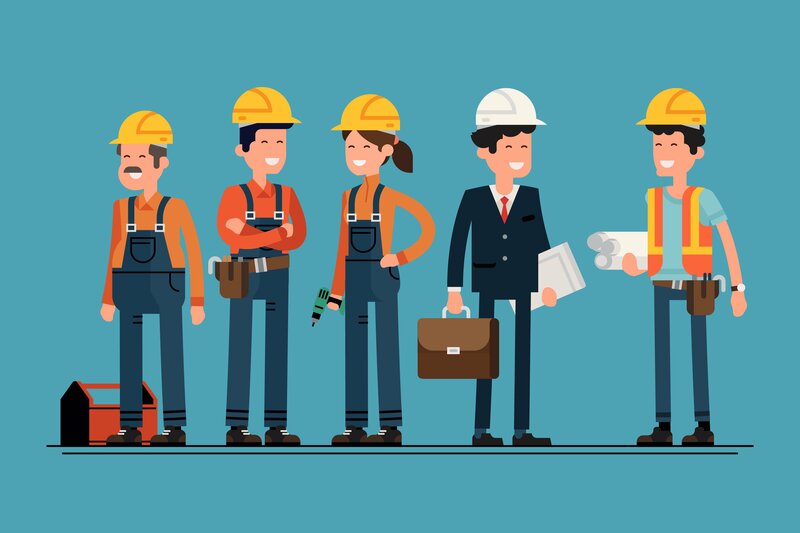 Manage your next tiny home project with our specialist project management software for architects. Find out more. But there is an emerging architectural movement that turns “Bigger is Better” on its head. 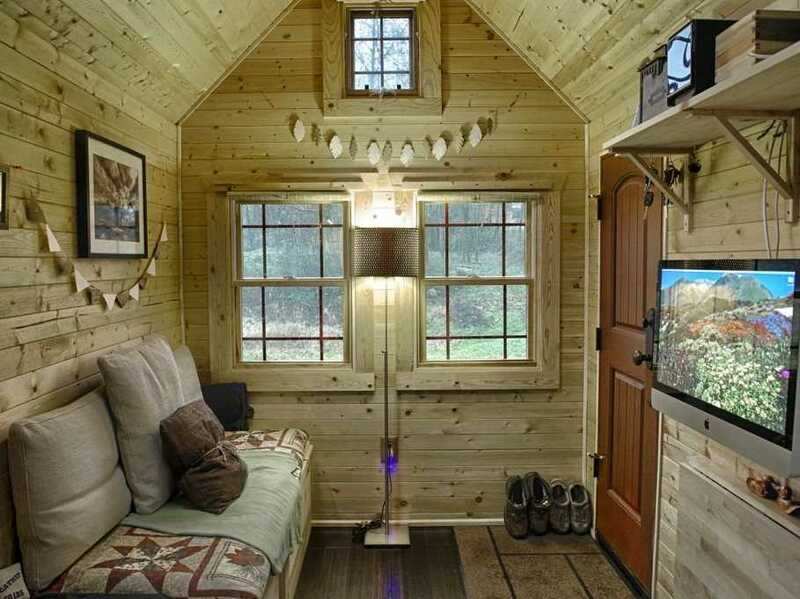 Tiny home and tiny buildings focus on condensing a building down into the smallest possible space, while still creating a home or office that is functional, beautiful, and pleasant to be in. Tiny buildings are rethinking the way we interact with spaces, and are challenging architects to think about buildings in an entirely new way. All over the world, architects and their clients are embracing their love of “tiny”. Here are 25 of the most beautiful tiny building designs. For centuries, yurts have been used by nomadic asian and middle-eastern tribes, who move across the deserts following the trade routes. 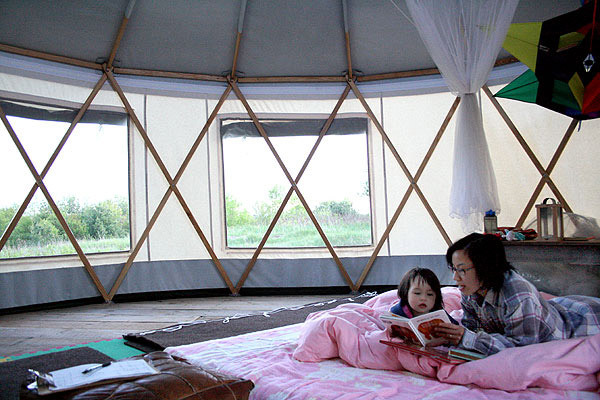 Yurts are large, homely tents that can be easily disassembled and moved. They are extremely sturdy and designed to withstand the rigors of desert life. Now, with tiny buildings becoming big business, many enterprising firms are looking at ways to incorporate yurt technology into their designs. Beautiful rustic home with all the modern requirements. Malissa and Chris Tuck wanted to simplify their life, so they sold up their typical suburban place and spend 800 hours and $20,000 building this beautiful 140sq foot wooden tiny house. There’s a kitchen, a bathroom, living room (complete with giant wall-mounted iMac), and loft sleeping area. Large windows make the space appear larger. Malissa now runs a website called The Tiny Tack House about their move to tiny living, and is even writing a book on tiny house layouts. Gary Chang turned his family’s 330sqm tenement apartment into a sleek, modern space by creating a range of sliding panels that could be moved around the space in a range of combinations. His panels can create 24 different spaces, creating bathrooms, kitchens, living spaces, and even a guest bedroom. As the panels move, they reveal hidden storage spaces and nooks. Chang calls the systems the “Domestic Transformer”. 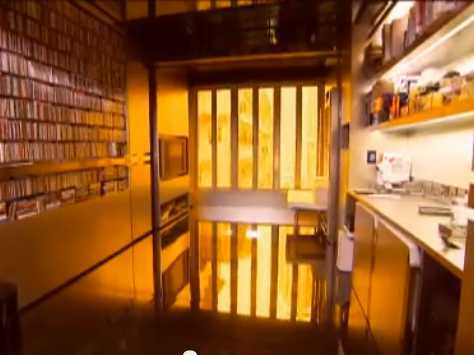 See more of Chang’s apartment. The Exbury Egg House is designed as a collaboration between PAD Studio, Stephen Turner and SPUD Studio. 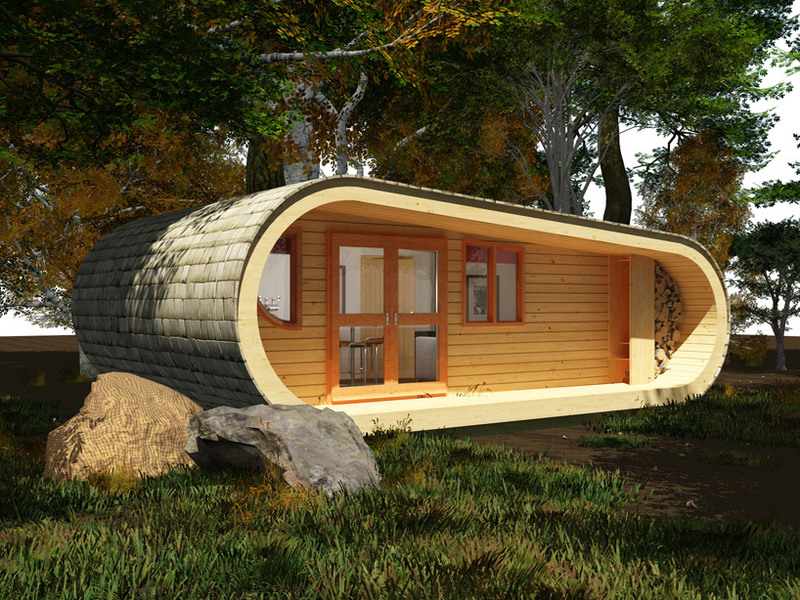 The group envisaged a tiny house built with boat-building techniques that could float on water. What they came up with is this undulating, egg-like structure, that will float on the water and includes all the comforts of home - a stove, a shower, and a bed. Power comes from solar panels on the top of the egg. 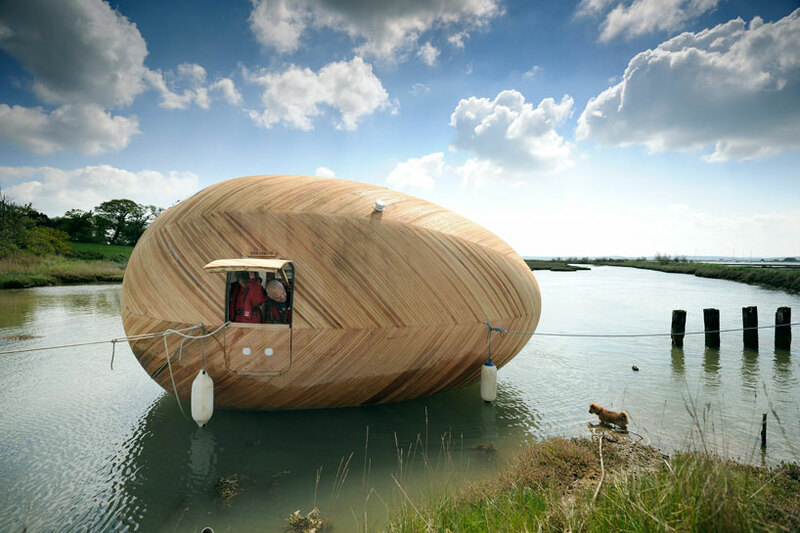 See some more images of the Exbury Egg. After James Stuart heard about a homeless woman who died when a fire engulfed her carboard shelter, he founded Twelve Cubed, a company that designs and fabricates 12x12x12 foot homes. The homes are two levels high and contain everything you need, including a bed, kitchen, desk, and bathroom. Steve lived in one of his Twelve Cubed units for eight months to prove it was possible, and he is working with several local governments to try and get his units as low-cost housing options. 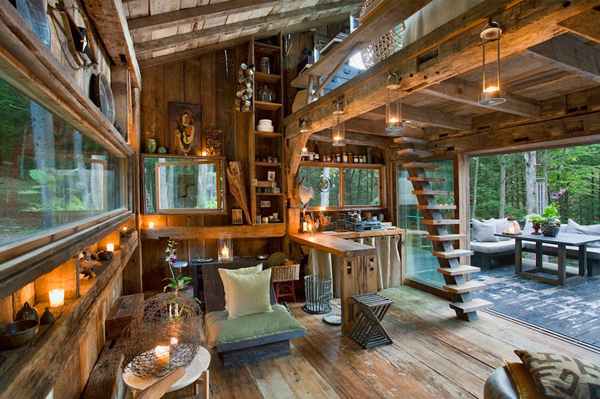 Fashion designer Scott Newkirk built this stunning cabin in the woods to escape the concrete jungle. The 14x14 foot cabin is made entirely of reclaimed wood, and is completely self-sufficient. Scott uses the cabin during the summer to unwind, and to aid him in his escape from the technological world, he has completely eliminated electronic devices from the cabin, from digital clocks to computers. It’s hard to believe this luxurious, spacious home is actually a 221sq foot trailer. Located in Ashland, Oregon, hOMe is designed by Andrew and Gabriella Morrison and was built over four months on a budget of just $33,000. Like many tiny-home architects and builders, the Morrisons could bypass certain building codes by creating a home on wheels. Black cabinets divide the space, as well as functioning as storage, and the house contains a fully kitted-out kitchen with oven, cook top, 18cubic foot fridge, and a wine rack. The hOMe is off-grid, meaning the couple live virually for free, having no mortgage and no utility bills. OTIS house - designed by students. 16 students at the Renewable Energy & Ecological Design programme at Green Mountain College (Vermont) have created this unique and beautiful tiny house. Designed with an aerodynamic shape, the OTIS (Optimal Traveling Independent Space) pod can be towed on a standard 5x8 foot trailer. A rainwater collection system supplies the interior plumbing, while solar panels give the tiny home its own supply of electricity. The beautiful cathedral window covering one wall makes this a unique and lovely space. Read more about OTIS on Grist. Perhaps the most famous company at the forefront of the tiny house movement, Tumbleweed homes are quaint, homely and simple to build, designed so that owners can build them themselves based off plans they buy and download for around $500. 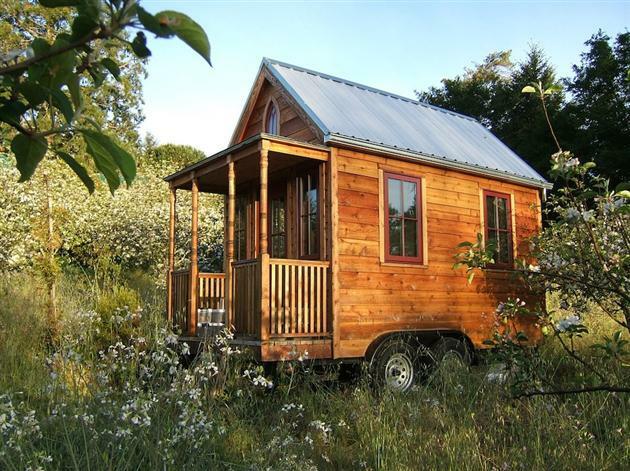 This tiny house is their EPU residence, which is 15 x 8 feet with a 7.5 x 3 feet porch. 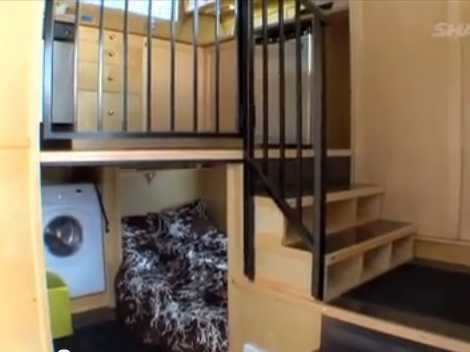 It contains a loft bed, desk, fireplace, wet bath and enough space to sling a (really small) cat. This tiny house has even been featured on Oprah! Beautiful views from the Eagle Point house. Designed by the team at Prentiss Architects, Eagle Point is a remote cabin on San Juan Island, Washington. 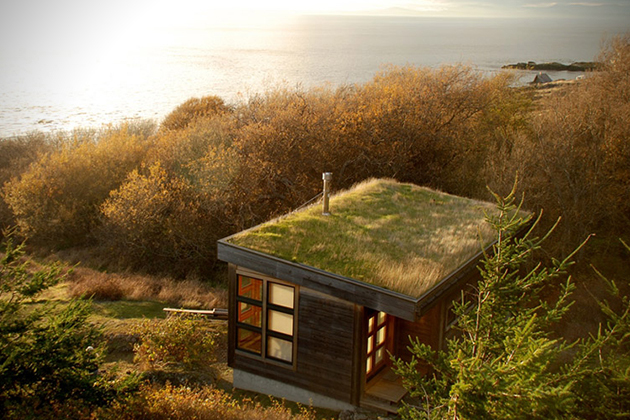 Made with a living grass roof, the cabin boasts some of the most spectacular views of the Pacific Northwest. 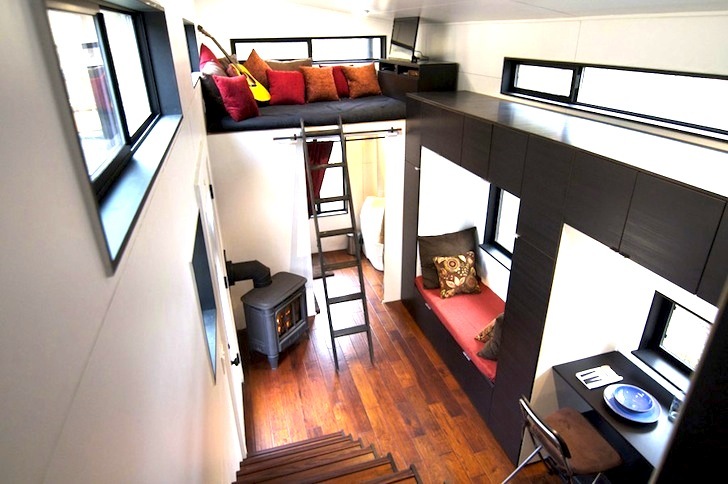 The interior is designed to be comfortable and offer the feeling of space on a small footprint. See more images from Eaguel Point. The Blue Forest architectural firm created the Eco Perch - a simple dwelling that you could literally “perch” anywhere, even in a tree. Built from natural materials, the Eco Perch sleeps up to four people and can be assembled onsite in just five days. With a footprint of just 20 x 26 feet, the Eco Perch crams a lot of style, eco-credentials and utility into a small space. Learn more about the Eco Perch. When Elizabeth Turnbull, a graduate student of Environmental Studies at Yale University, wanted to save money and experiment with ecologically-friendly housing, she found the typical student accommodation sadly lacking. So she built her own tiny house - a 144sqm home from environmentally-friendly, sustainable materials, such as FSC-certified wood, recycled windows and non-toxic finishes. See a video about Turnbull’s house. 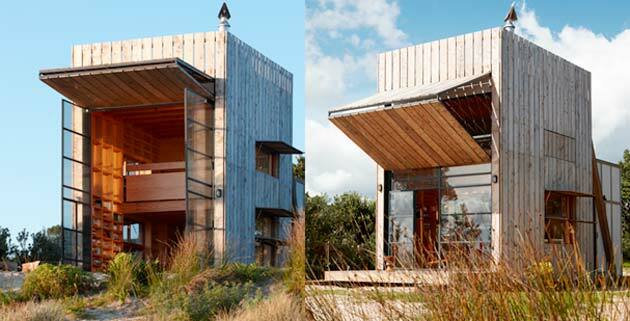 From Whangapoua, New Zealand, comes this portable beach residence on skids. If the tide is threatoning your front step, you can simply slide your house along to a more desirable location. Designed by the team at Crosson Clarke Carnachan, the two thick wooden slabs not only hold up the structure, but they allow it to be easily moved from place to place. Enjoy sunsets over the ocean from the rooftop deck - it’s bliss! See more from the Beach House here. Futuristic interior of "the Blob". 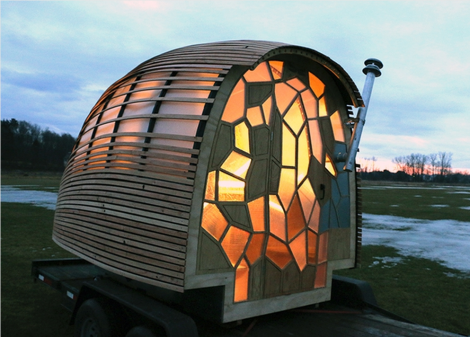 dmvA Architects designed this ultra-modern Blob VB3 mobile tiny home. With its futuristic styling and ample storage space, the Blob might be a glimpse into the next generation of mobile homes. The back flips out to become a shaded “deck” area, and everything from kitchen appliances to a shower to a bed are stored away inside the spacious interior. Interestingly, the Blob is built mainly of polyester. 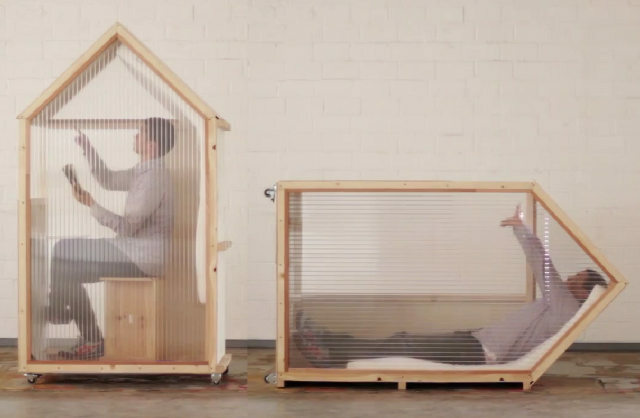 Rollit homes work like a giant hamster wheel. Designed by students at the University of Karlsruhe in Germany, these stylish tiny homes contain undulating walls and surfaces that create beds, couches, benches, a shower, a toilet and other furniture. 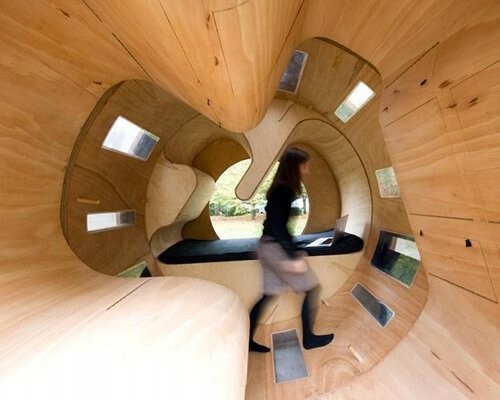 To change the use of the Rollit room, the owner stands in the centre and walks, rotating the home like a giant hamster wheel. When real estate is at a premium, enterprising architects can squeeze living space out of seemingly impossible parcels. Polish architect Jakub Szezesny sandwiched this apartment - possibly the skinniest in the world - between two other buildings. There are no windows, the table will only seat two and the kitchen contains a fridge only wide enough for two sodas. See more images of the Skinny House. Thanks to a complex built-in computer system, the Xerohouse is completely automated and self-sufficient, generating its own electricity from solar panels on the roof, recycling its own waste and harvesting its own rainwater. The two stacked rooms create a third space for outdoor living - completing this morning, sustainable tiny dwelling from architects Specht Harpman. 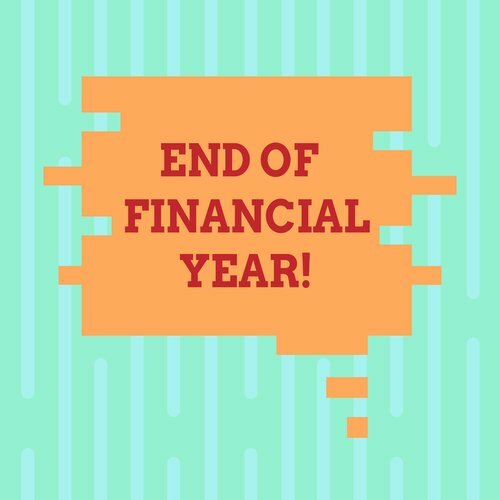 Read more about Xerohouse. Space is at a premium in the Big Apple, so enterprising apartment-dwellers are going to extremes to make efficient use of their space. Brooklyn architect Tim Seggerman designed this 240sq foot apartment space to give the residents more bang for their buck. 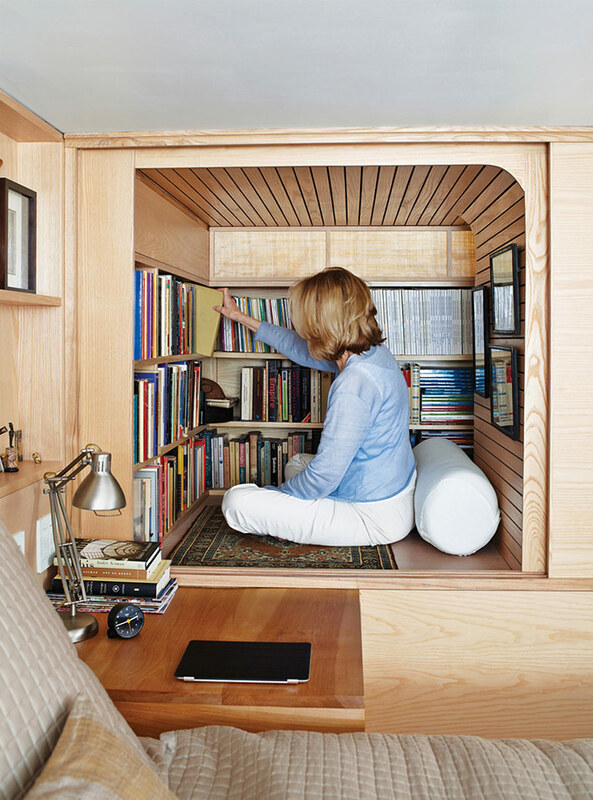 The space includes this cosy book nook. Stylish and cosy Polish apartment. 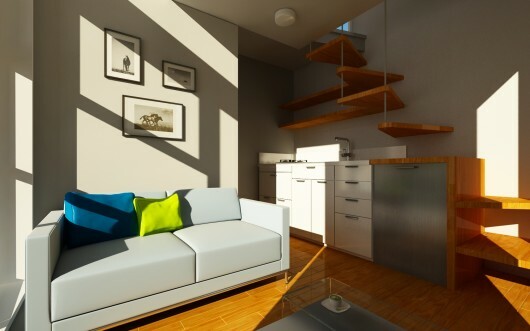 Could you live in an apartment that was just 29sq (316sq feet) in area? With a design as clever as this one, it's definitely possible. Polish design firm 3XA Architects created the "semi-mezannine" level to house the bed, thereby increasing the useable space in the apartment. Kitchen and dining become one space, and bookshelves create a focal point. House filled with insulation made from mushrooms. OK, so this Mushroom House looks like nothing more than a garden shed on wheels, and frankly, that's because it isn't. 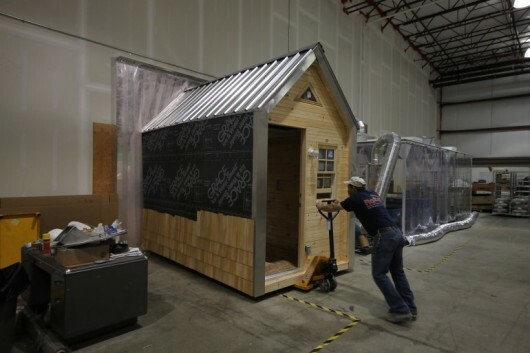 But what it IS is a prototype for a unique new product that could revolutionize tiny house building. Insulation made from mycelium (mushroom fungi) insulates this tiny house, keeping it cool in summer and warm and dry in winter. This mushroom insulation looks and feels like standard insulation, except that it produces no harmful toxins and has a positive effect on the environment when grown. 22. NOMAD, Vagabond, call me what you will. The NOMAD micro-home is designed to be the ultimate in DIY tiny home design. Created in flat-pak form, the home can be quickly shipped to site and put together using instructions, just like a piece of IKEA furniture. 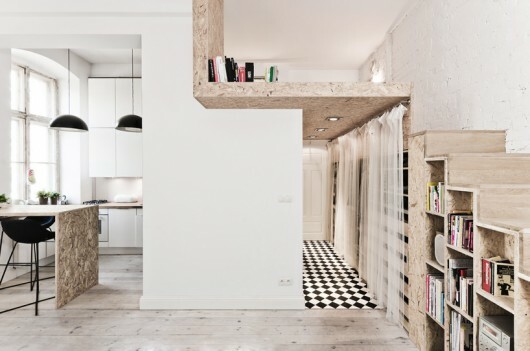 In a unique space-saving measure, the kitchen benches and shelves also form the steps to the loft bedroom. An affordable, portable and stylish tiny building alternative. Read more about NOMAD here. Hobbit house - a home office. 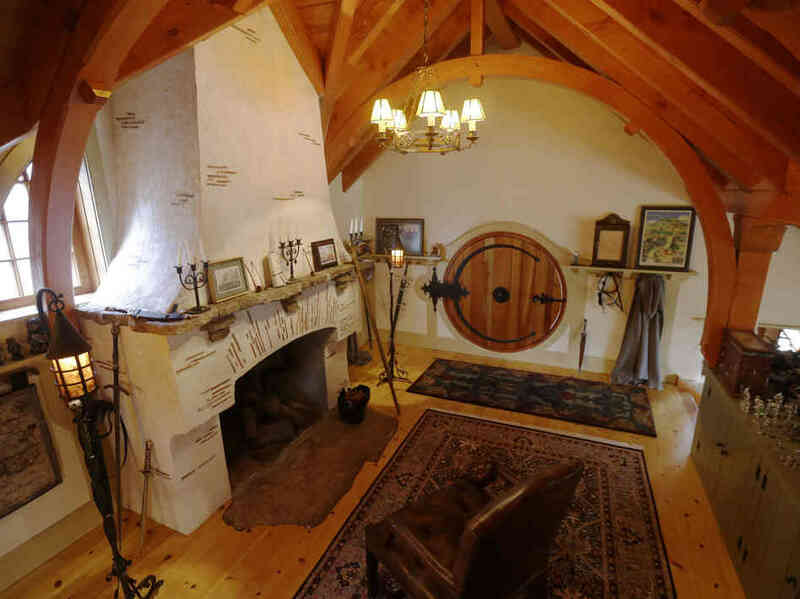 And he’d probably live in an officially-licensed hobbit hole from Wooden Wonders, who create custom-designed hobbit holes for a variety of uses, from chicken coops and children’s playhouses, right up to cottages. Hobbit holes are cosy, small and comfortable, and a wonderful way to add space to an existing home. Many people, such as the writer’s hole in this picture, have created their own hobbit holes in their gardens to use as a study or secret nook. Disused shipping containers can be an interesting source for the basic structure of a building, but they need a lot of work to get them to a “liveable” point. 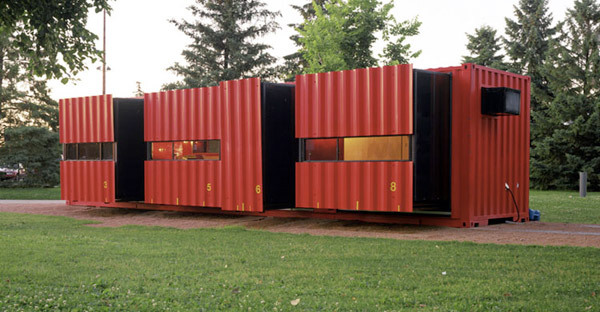 Lot-ek’s mobile unit is an example of shipping-container architecture done right. 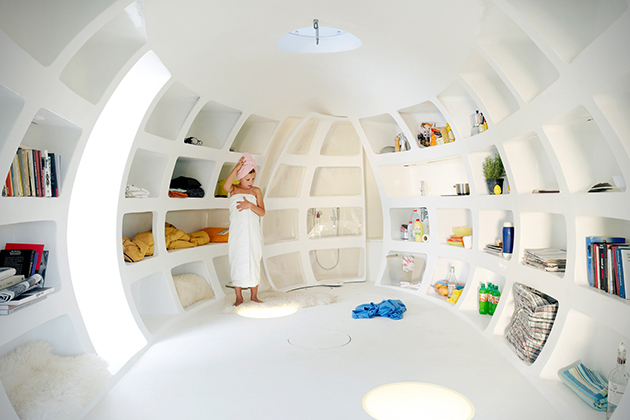 The modules slide out, creating an eating nook, kitchen, and bathroom. 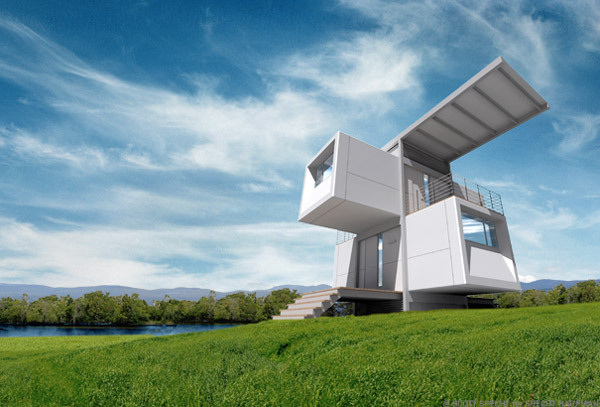 If the home is going to be relocated, the modules slide back in, bringing the container back to its original form, and could be shipped as it. 25. The world’s smallest “home”. This house's footprint is only 1sqm. Architects are always trying to push the boundaries, and German architect Van Bo Le-Mentzel is no different. He created a “house-shaped” portable home with of footprint of only one square metre. The home is light enough to be wheeled around, and when tiled on its side, provides enough room to lie down for sleep. Le-Mentzel created the space because he wanted people to re-define the way they thought of “home”. However, many governments and private citizens across the world have contacted him about purchasing his 1sqm homes. Read more about Le-Mentzal’s tiny home. Have you ever designed a tiny home for one of your clients? 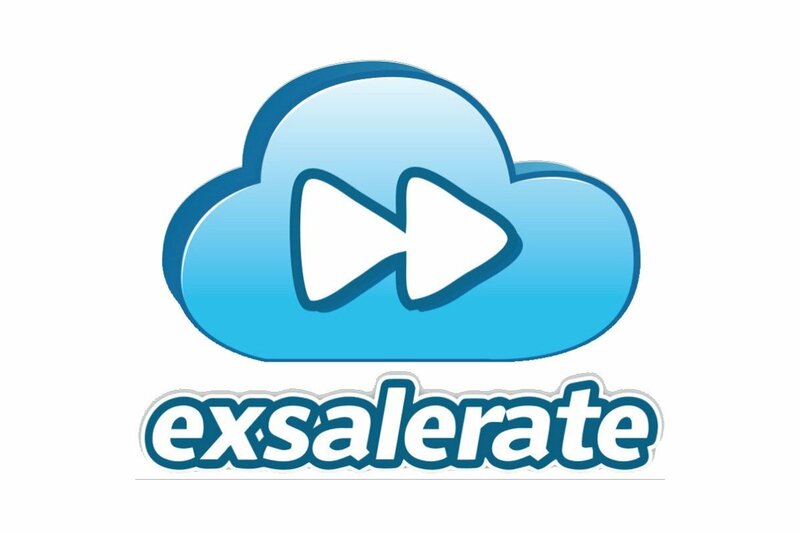 What were some of the unique challenges you faced?